March 1 marks the opening weekend of SWAC baseball as four of the five teams square off. Salt Lake Community College plays Colorado Northwestern Community College and the College of Southern Idaho takes on the College of Southern Nevada. USUE will have a bye, and start its season March 8 playing CNCC. With this in mind, it is a good time to preview this year’s SWAC teams; to perhaps give a little forecast as to what the Eagles are up against this season. Summary: The defending champions return 12 players and figure to be a tough task for their opponents. Coming off a third place finish in the national tournament, the Golden Eagles will have their eyes on a national title this season. The big news for them is the return of last year’s conference MVP and first team all-American Hayden Leatham (.367 avg 8 hr 80 rbi in ’18). He should prove to be a huge asset for them. Summary: The Bruins are coming off an impressive season in which they played well enough to advance beyond the conference tournament to the district tournament, where they were eliminated by Arizona Western. Although they have 19 returning players, not all of these players made meaningful contributions (in fact, most did not) a few players to watch are shortstop Jaxson Otis (.316 avg in ’18), center-fielder Brady Brook (.935 ops in ’18), and pitcher Fynn Chester (first team all SWAC in ’18) who will miss the beginning part of this season due to an arm injury. Summary: After a disappointing season for the Coyotes in 2018, they will look to bounce-back this year. 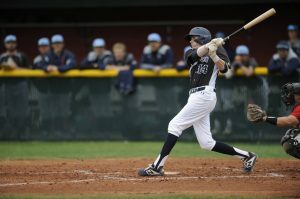 Always a competitor for the SWAC crown, CSN will have to replace last year’s two way superstar Joey O’Brien, who was selected in the early rounds of last year’s MLB draft. Sophomore catcher Nick Hernandez will be a big help in this effort, as he hit .330 last year, not to mention his good work behind the dish. Summary: Fresh faces characterize this year’s USUE club. Only eight players return, but with a wealth of young talent the Eagles look poised to improve upon last year’s success. Returners TJ Bender (.303 avg in ‘18) and Ryan Curtis (13 sb in ‘18) will look to pace the Eagles offense while Jake Smith will look to build off last season’s success on the mound to help Eastern reach its goal of a SWAC title. Summary: Cellar dwellers from last season, CNCC strives to improve. Dane Perry hit .354 for an otherwise stagnant offense for the 2018 club. Perry is back and hopes to do similar damage along with welcomed production from fresh faces. Known as one of the best junior college baseball conferences in the nation, the SWAC will be competitive in 2019. The Eagles look to use their underdog mentality and take home the conference crown.